I have always been the same colour on fingers and toe nails kind of girl. But lately I've been enjoying doing these different colour pairings on my nails. In general I opt to place darker colours on the toes than on the fingers. My personal all time summer combo is a red orange on the toes and a pastel shade on the nails. These are some of my favourite colour combinations. Perfect polish combos to try for your next mani-pedi. This pairing is full of life. It's fresh, girly and so summery. Essie Tart Deco + Kiko 338. I love the pastel colour of these two and I think they go perfect together. This transport me to the beach! This is one of my favourite vacation combination. I love an orange colour on the nails during summer. These are a perfect match in my opinion. It's more a safe and neutral option for who likes to stay in a neutral toned palette. Essie Exotic Liras + Barry M| Gelly Sugar Apple. The raspberry color looks so feminine and the mint shade just gives a fresh look perfect for this season. Essie Fifth Avenue L'Oreal Color Riche Ocean Porcelain. This is feminine, bright and fun. What's your favourite mani-pedi colour combo? 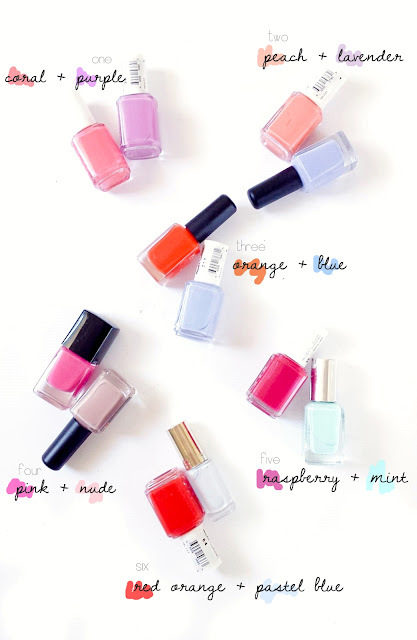 6 comments on "Mani-Pedi Color Combos for Summer"
Loving the raspberry and mint combo! I love this post, super creative and I always struggle to pair my nail varnish together.